I don't know what to think about this. I don't like breeders and I don't like cats, but these spooky lycoi cats are something else. A cat that looks like a werewolf and, according to its Tennessee-based human creators, acts like a dog. I have to admit they are quite cute in their freaky ugliness. Like a reverse evil bulldog. The Lykoi Cat is a natural mutation from a domestic shorthair that has the appearance of a werewolf. The mutation has occurred in other cats, but to date, no reports of anyone starting a breed have been made. Our founding cats come from two unrelated litters. The first litter was presented to Patti Thomas as a possible Sphynx mutation (which was later disproved with DNA testing). We have noticed that the black colored cats express the pattern of the werewolf cat more dramatically so we are focusing on only producing solid black cats that have the gene. Upon starting the program Johnny (who is a veterinarian) decided that testing would need to be done to ensure that we are not dealing with disease or disorders casuing the hair coat appearance. Infectious disease tests were performed first in his clinic. DNA testing was then done by UC Davis to confirm that these cats do not carry the Sphynx/Devon gene (all results came back proving that NONE of the founding cats have the Sphynx/Devon gene). We also performed DNA panels for genetic disease, color and blood tupe. At the University of Tennessee, dermatologists examined them for any skin abnormalities (and they too fell in love with these cats!). Along with biopsy samples of the skin, the dermatologists could find no reason for the coat pattern. What they did find is that some hair follicles lacked all the necessary components required to create hair (which is why Lykoi lack an undercoat). 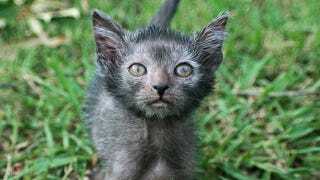 They also found that the follicles that were able to produce hair, lacked the proper balance of these compontents to maintain the hair (which is why Lykoi do molt and can become almost completely bald from time to time). Our cardiologist also performed cardiac scans to look for any structural problems with the hearts. In the end, we found that the cats are healthy and the hair pattern is not from any known disease or disorder. It was determined that it was indeed a true natural mutation and the Lykoi breeding program began! September 14th, 2011 we welcomed the first kitten from a Lykoi to Lykoi Cat breeding. We have noticed that the black colored cats express the pattern of the werewolf cat more dramatically so we are focusing on only producing solid black cats that have the gene. Since their parentage is domestic shorthair (no known pedigreed cats have been involved) we are outcrossing using only black domestics. This is being done to broaden the gene pool and ensure healthy kittens. Although the founding Lykoi and subsequent outcrossing has all been done here in our cattery in Tennesse, we have now placed breeding Lykoi with breeders in the USA, Canada and France. We are also keeping in contact with two genectists that are working on discovering more about this unique gene! You can see and learn more about these tiny beasts here.